Microchip has launched its first family of PIC32 microcontrollers with periperhals that can run independently of the core. This is a big step, as it helps to reduce power and simplify the development and operation of nodes in the Internet of Things (IoT) . The MIPS MicroAptiv-based PIC32MM family bridges the gap between the company’s popular PIC24F XLP and PIC32MX families. But what makes this more significant is that the new family is the first PIC32 to feature core independent peripherals, designed to offload the CPU for lower power and lower system design cost. The PIC32MM devices are supported by the Microchip MPLA Code Configurator (MCC) to help simplify and accelerate designs. Today’s embedded applications targeting the Internet of Things (IoT), consumer, industrial control, and motor control require flexible MCUs that consume less power, are more cost effective and have smaller form factors. For applications demanding low power and longer battery life, the PIC32MM has sleep modes down to 500 nA. Applications with space constraints will benefit from the small 4x4 mm package options. The PIC32MM devices include core independent peripherals such as Configurable Logic Cells (CLC) and Multiple-output Capture Compare PWMs (MCCPs) which help enable sensorless BLDC motor-control applications. To help accelerate evaluation and development, a new $25 PIC32MM processor plug-in module is available (MA320020), which plugs into the $130 Explorer 16 Development Board (DM240001). 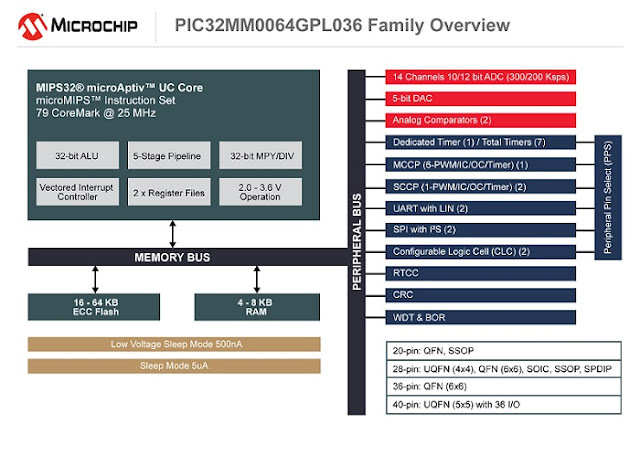 The entire family of PIC32MM devices is supported by the Microchip MPLAB ecosystem including MPLAB X IDE and XC32 compiler. The MPLAB Code Configurator, a plug-in to the MPLAB X, helps with easy peripheral set-up, device configuration and pin mapping. The PIC32MM family is available in mass production today in 20-pin QFN and SSOP; 28-pin µQFN, QFN, SOIC, SSOP, SPDIP; 36-pin QFN; and 40-pin uQFN packaging. Devices are available in 16 KB, 32 KB, and 64 KB Flash variants. Swiss wireless chip and module maker u-blox has launched the world’s first cellular radio module compliant to the 3GPP Release 13, Narrowband IoT (LTE Cat. NB1) standard, opening up the use of cellular networks for the Interent of Things for the first time. The module is designed for use in applications such as smart buildings and cities, utilities metering, white goods, asset tracking, and agricultural and environmental monitoring and operate for between 10 and 20 years from a single-cell primary battery which has just not been possible up until now. This will also drive up volumes and drive down costs to make cellular IoT cost effective. 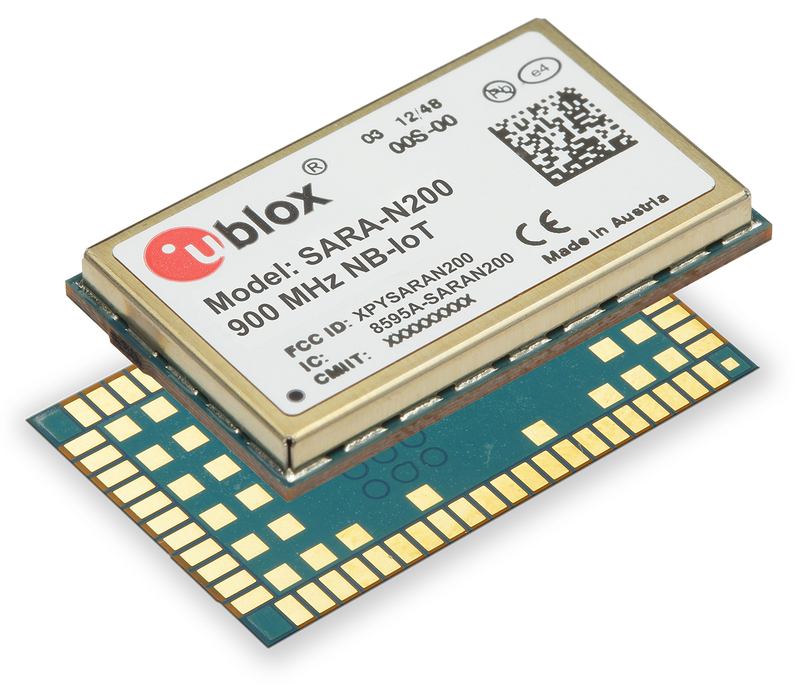 The SARA-N2 Narrowband IoT (NB-IoT) module (above) measures 16 mm x 26 mm in a land grid array (LGA) package using u-blox nested architecture, and allows simple upgrades from u-blox GSM, HSPA or CDMA modules and ensures future-proof, seamless mechanical scalability across technologies. The SARA-N2 module provides secure, private communications over licensed spectrum with guaranteed quality of service. It supports peak downlink rates of up to 227 kbps and uplink rates of up to 21 kbps, which keeps the power down aand allows the ten to twenty year battery life. Simultaneous support for three RF bands means that the same module may be used in most geographic regions. The NB-IoT provides lower device complexity, ultra-low power operation and support for up to 150,000 devices per single cellular cell. Most significantly, the technology offers a 20 dB link budget improvement over GPRS to give excellent performance under poor coverage conditions such as underground or inside buildings. Compared with unlicensed spectrum Low Power Wide Area (LPWA) solutions, NB-IoT offers greater security and freedom from interference because it uses a licensed spectrum based network. Other advantages include lower latency than mesh networks, thanks to its point-to-point topology, the ability to run it adjacent to existing 2G and LTE networks - it needs just 200 kHz of bandwidth - and a higher transmit power limit, which improves reliability and range. It also allows for robust 2 way communication which means that features such as firmware upgrade over the air are achievable. NB-IoT also allows global roaming, which is not the case with localized unlicensed spectrum based technologies. Samples of the SARA-N2 NB-IoT module are currently scheduled for Q4 2016, with full production planned for early 2017. An interesting story at EETimes Europe is demonstrating the global forces at work to provide the technologies for the Internet of Things. US power line communications (PLC) chip designer Semitech Semiconductor has teamed up with a Brite Semiconductor in Shanghai on a new generation of PLC chips that can handle both PLC and wireless communications around the world. The chip will be manufactured using an advanced process with SMIC, which helped set up Brite, and will contain Semitech's integrated PLC/wireless IP. This provides the dual-mode communication core (DMCC) including architecture, digital modules and algorithms that can simultaneously support reliable wireless and PLC connectivity for the M2M and Internet of Things (IoT) market. This IP is already used in machine-to-machine communication and IoT applications such as smart meters, street lighting, solar panels and remotely monitored and controlled industrial equipment, providing a core technology to implement a worldwide communications network over the existing power grid. The latest power newsletter is out from EETimes Europe, with $4m for a new silicon graphene battery development, 3D packaging developed for data centre power, TI cutting the size and resistance of MOSFETs by up to 80% and the exclusive Power Trends Interview with Siobhan Dolan Clancy, the general manager of the discrete products division of Microsemi. RapidIO.org has launched the next generation of its interconnect architecture, targeting 25xN 100Gbit/s performance for 5G wireless and data centre infrastructure as well as industrial embedded systems. With more than 200 million RapidIO fabric ports deployed worldwide at speeds of 6xN and 10xN 10-50 Gbit.s in analytics, wireless infrastructure, industrial and military applications, the 25xN 100 Gbit/s specification provides an open standard interconnect fabric for systems requiring heterogeneous coherent computing infrastructure that can scale with non-volatile storage. Director of Next Generation Platform Technologies at drive maker Western Digital. “We see the public release of the 25xN 100 Gbps RapidIO Specification as a key enabling building block for these coherent, non-volatile storage based systems,” he said. The technology will be integrated into embedded system-on-chip devices with cores from ARM and MIPS as a way to link different types of computing resources together with low latency using standalone switches from suppliers such as IDT. The next generation of Bluetooth promises to provide four time the range of the current versions with twice the bandwidth in a bid to create a “connectionless” IoT. The Bluetooth Special Interest Group (SIG) has reached a major milestone with 30,000 members using the technology in one way or another. Bluetooth 5 tackles some of the challenges that have held previous versions back in the roll out of IoT networks. The new technology will be released later this year or early 2017 with significantly increased range, speed, and broadcast messaging capacity. 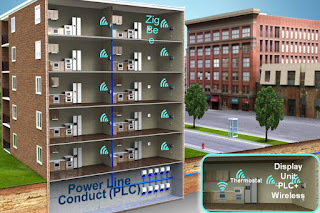 Extending range will deliver robust, reliable Internet of Things (IoT) connections that make full-home and building and outdoor use cases a reality. Higher speeds will send data faster and optimize responsiveness. Increasing broadcast capacity will propel the next generation of “connectionless” services like beacons and location-relevant information and navigation. These Bluetooth advancements open up more possibilities and enable SIG companies – now at an all-time high of 30,000 member companies – to build an accessible, interoperable IoT. DSP designer CEVA is already engaged with multiple customers whose silicon will incorporate these Bluetooth 5 features when the standard is finally ratified later this year. RivieraWaves is part of CEVA and is the leading IP vendor providing solutions for both Bluetooth low energy and Bluetooth dual mode (i.e. Bluetooth classic combined with Bluetooth low energy), with a long pedigree stretching back more than fifteen years. As a result, CEVA Bluetooth IP has shipped in more than a billion devices to date. "We see very strong traction in the market for these features. Indeed, we already have some licensees with silicon prototypes implementing some of these Bluetooth 5 features and we look forward to the wide scale deployment of Bluetooth 5 in due course,” said Aviv Malinovitch, vice president and general manager of CEVA's Connectivity business unit. The RivieraWaves Bluetooth IP platforms consist of a hardware baseband controller, plus a feature-rich software protocol stack. For Bluetooth low energy, this protocol stack encompasses the Link Layer up to the GAP/GATT plus a comprehensive set of Services and Profiles. For Bluetooth dual mode, this protocol stack presents an industry standard HCI interface. A flexible radio interface allows the platform to be deployed with either RivieraWaves RF or various partners’ RF IP, enabling optimal selection of foundry and process node. Today, there are 8.2 billion Bluetooth products in use, but at least 4bn of these are the mobile phones that act as a terminal for a Bluetooth link. The SIG has ambitious plans that the enhancements in Bluetooth 5 and planned future Bluetooth technical advancements mean that Bluetooth will be in more than one-third of all installed IoT devices by 2020. SIG membership has grown over 11 percent since the end of 2015, now reaching a record-high with its 30,000th member, Blossom Group, a startup that is building infrasound and low-frequency noise relaxation products. Software AG and Dell has developed a new architecture for the internet of things (IoT) that allows enterprises to perform real-time streaming analytics at the edge of the network, close to digital devices and sensors. The system uses Dell’s Edge Gateway 5000 Series combined with an embedded version of Software AG’s Apama Streaming Analytics (below). Performing real-time analytics on the edge can drastically reduce the cost of high volume Industrial IoT sensor traffic and the need for expensive central servers. This architecture also allows for the rapid deployment of edge analytics, and reduce the cost of IoT projects. This first joint Dell and Software AG solution focuses on preventative and predictive maintenance, with further IoT use case solutions to follow in the near future. Together, Dell and Software AG have created a Predictive Maintenance Blueprint entitled “Six steps to using the IoT to deliver maintenance efficiency” to help companies address their top operational challenges. This ensures that perishable data is acted on immediately by generating alerts, implementing an automated response on the Edge and ensuring that only meaningful data is sent to the cloud to minimize consumption of network bandwidth. This reduced data set can be integrated with historical data at the core and longer term trends and events identified and predicted. With estimates ranging from 15 to 40 billion new sensors being installed by 2020, it is imperative that real-time streaming analytics, driving automated decisions and responses, be located as near to the Edge as possible. The architectural benefits of distributed real-time analytics are decreased latency times for real-time events, a significant reduction in network traffic and a reduction in the central server power needed to cope with tens or hundreds of thousands of sensors. This fully scalable and flexible new architecture makes decisions on the Edge when appropriate and at the core when needed. Toshiba is hoping a new process technology it has developed to increase resistance to Electrostatic Discharge (ESD) in devices will help. The 0.13μm process technology at New process boosts ESD protection | EETE Power Management optimizes the structure of transistor and significantly improves ESD characteristics by a factor of four, while the standard deviation is only 1/12 that of the conventional structure. Analysis of 3D simulations has also allowed Toshiba to identify a mechanism for optimizing transistor structure to boost ESD robustness. ESD protection devices are required to protect internal circuit and this is particularly true for analogue power semiconductor devices required to apply 10V to 100V, which need a high rated voltage. In this case, ESD protection devices must ensure high current flow, which results in enlarged chip size. Shrinking the size of the ESD protection device is an issue in realizing more compact chips. Using 3D simulation analysis of an ESD event, Toshiba found out that ESD induced destruction is caused by lattice temperature increase due to the current flowing at the highest electric field point. Modifying the transistor structure, which extending the drain low resistive region to the source direction and suppressing the lateral silicon resistance, shifts the current flow from the bottom of the drain to source direction and detaches it from the highest electrical field point. This optimized design was found to increase ESD robustness by up to four times and to decrease the standard deviation down to 1/12. In addition, the device size required to ensure a HBM (Human Body Model) of ±2000V was cut by 68%. To help tackle the challenge of securing the Internet of Things (IoT), ST has launched a separate security chip that can connect to any microcontroller via an I2C link. The STSAFE-A100 can be designed-in by developers to provide security to Common Criteria EAL5+ without specialist security expertise through a comprehensive support ecosystem. The STSAFE-A100 provides strong authentication services (see figures below) that help make sure only authorized IoT devices can access online services and only authorized accessories or consumables are recognized and accepted by an application. Interestingly, it is also compliant with the USB Type-C device-authentication scheme and secures communications with a remote host using Transport Layer Security (TLS) handshaking. The chip uses a custom secure microcontroller (ST hasn't said which type of controller - the company uses the ARM SecureCore in other devices such as the ST19 and ST33 families) with its own embedded operating system that is certified to EAL5+, base don the company's experience in chips for highly secure banking and mobile phone billing systems. Additional functions in the chip that further minimize any potential for security breaches include signature verification to ease secure boot and firmware upgrade, secure counters that allow usage monitoring, secure pairing with the host application processor, wrapping and unwrapping of local or remote host envelopes, and on-chip key-pair generation. The STSAFE-A100 supports asymmetric cryptography including Elliptic Curve Cryptography (ECC) with NIST or Brainpool 256-bit and 384-bit curves, and symmetric cryptography using AES-128/AES-256. The STSAFE-A100 comes with a unique serial number on each die and its operating system comprises a kernel for authentication and data management and provides strong protection against logical, fault, side-channel and physical attacks. ST has made design-in of its new secure element easy for customers by providing a complete ecosystem that includes an expansion board with Arduino headers, a microcontroller library, and reference implementations. These simplify attaching the STSAFE-A100 to a microcontroller such as any from the STM32 family. The STSAFE-A100 secure element is scheduled to enter volume production in July 2016, as a 4mm x 5mm SO8N or 2mm x 3mm UFDFPN8. One of the promising narrowband wireless protocols for the Internet of Things, Weightless, is moving towards an international standard. The Weightless SIG is partnering with the European Telecommunications Standards Institute (ETSI), and a key ultra narrow-band (UNB) LPWAN technology and applications provider, Telensa, is to the board of the Weightless SIG. This is the first step on standardisation and the move is supported by several other UNB technology companies (announcements to come). Weightless is supported by Neul which in September 2014 was acquired by Huawei. “In order to reduce fragmentation and enable critical mass in the marketplace we are bringing these two initiatives together, immediately reducing fragmentation and providing a platform around which industry can coalesce,” said Weightless CEO, Professor William Webb. Low Power Wide Area networks are set to become an integral building block for a variety of connected products and services. Deploying such networks also in unlicensed spectrum is critical to ensuring that the market for IoT connectivity will remain sufficiently competitive. The initiative is important, because it can open up a whole new level of scale benefits to players that are driving the unlicensed networks forward. 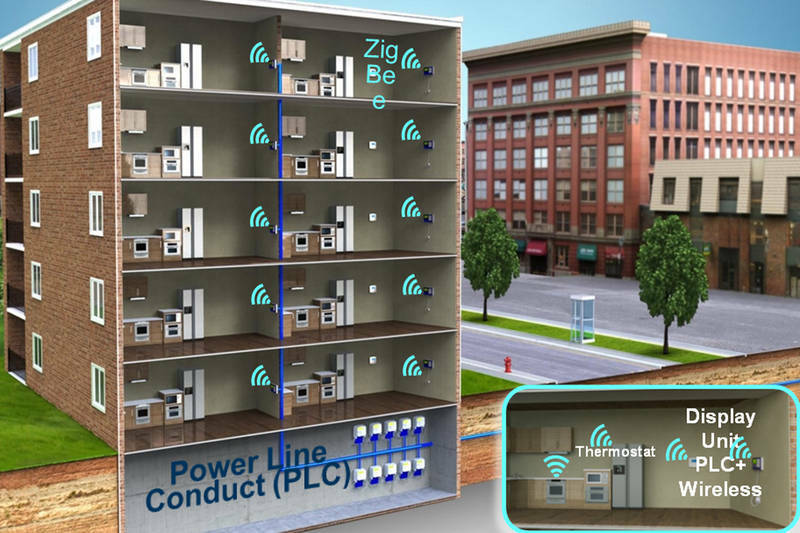 Cypress Semiconductor has launched a new programmable system-on-chip that simplifies the design of next-generation industrial, home appliance and consumer systems that require multiple sensors. Many Internet of Things (IoT) applications require multiple sensors and can benefit from dedicated coprocessors that offload sensor processing from the host and reduce overall system power consumption. At the same time the analogue element of the design is often a challenge. The new PSoC Analogue Coprocessor integrates programmable analogue blocks, including a new Universal Analogue Block (UAB), which can be configured with GUI-based software components. Based on a 32-bit ARM Cortex-M0+ signal processing engine, it delivers a fully programmable analog front end with op amps, programmable gain amplifiers, analog multiplexers, analog-to-digital converters, analogue filters and digital-to-analogue converters (DACs). This simplifies the design of custom analogue front ends for sensor interfaces by allowing engineers to update sensor features quickly with no hardware or host processor software changes, while also reducing overall costs. For example, in home automation applications, engineers can easily configure the coprocessor to continuously monitor multiple sensors, such as temperature, humidity, ambient light, motion and sound, allowing the host to stay in a standby low-power mode. Future design changes to support new sensor types can also be easily implemented by reconfiguring the programmable analog blocks. The design of custom sensor interfaces is handled by Cypress’s free PSoC Creator Integrated Design Environment (IDE), which simplifies system design by enabling concurrent hardware and firmware development using PSoC Components—free embedded ICs represented by an icon in the IDE. Engineers can easily configure the programmable analog blocks in the Analogue Coprocessor by dragging and dropping components on the PSoC Creator schematic and customizing them with graphical component configuration tools. The components offer fully engineered embedded initialization, calibration and temperature correction algorithms. The PSoC Analog Coprocessor is available in a 3.7-mm by 2.0-mm chip-scale package option and is currently sampling with production expected in the fourth quarter of 2016. Parts will be available in 45-pin CSP, 28-pin SSOP, 48-pin QFN and 48-pin TQFP packages.